It’s time for a delicious treat which will make your mouth water. 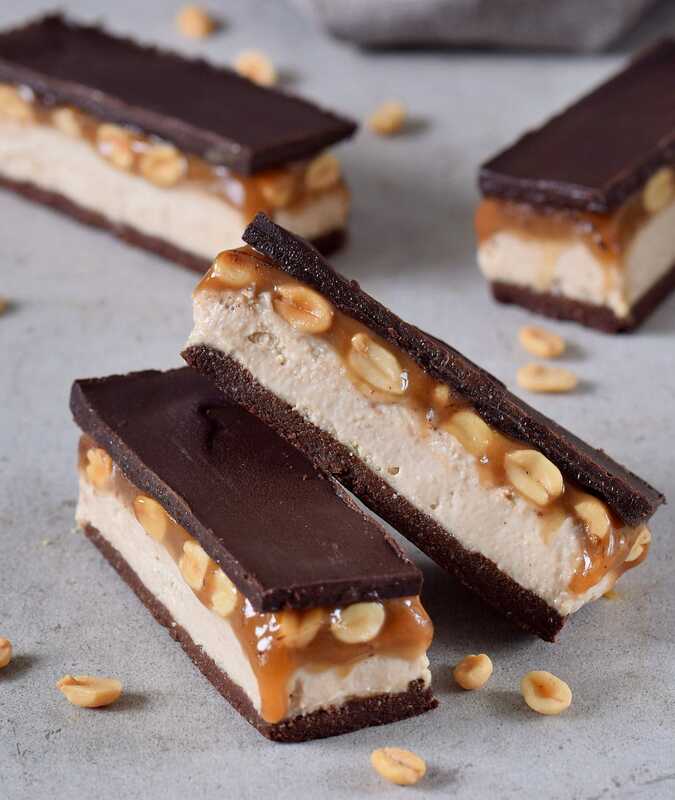 These delicious Vegan Snickers Bars are a wonderful treat if you not only love chocolate but also caramel and cream. Are you ready for this dairy-free, gluten-free, no-bake recipe? Yes? Ok, let’s start! It took me ages (ok, not ages, but many weeks) to perfection this recipe. I have tried out at least 5 different versions and probably gained 5 pounds of weight while I tested the recipe (just kidding, it’s all about balance, right). Finally, I came up with a version which I really love and a version which is equally delicious and even healthier. I will include both versions below. For the base, I simply used my healthy no-bake brownies recipe. 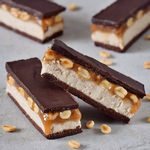 It’s one of my most popular recipes on my blog and I thought why shouldn’t it be part of these delicious Vegan Snickers Bars?! For the cream layer, I used cashews, coconut cream, a liquid sweetener (you can use agave syrup, maple syrup or rice syrup etc). I added 1/2 cup of oat flour but you can, of course, also use almond flour for a grain free version. The caramel layer was the hardest part because I wanted to make it as healthy as possible, but still delicious. My first version was made with coconut sugar, however, the caramel layer didn’t firm up in the fridge or freezer, so for the next version I used brown sugar which worked better but I didn’t like to use so much sugar and furthermore, the caramel layer turned out too firm. So I tried a combo of brown sugar and syrup which worked pretty good! And, I also made a refined sugar-free version with dates which you will find in the recipe notes. 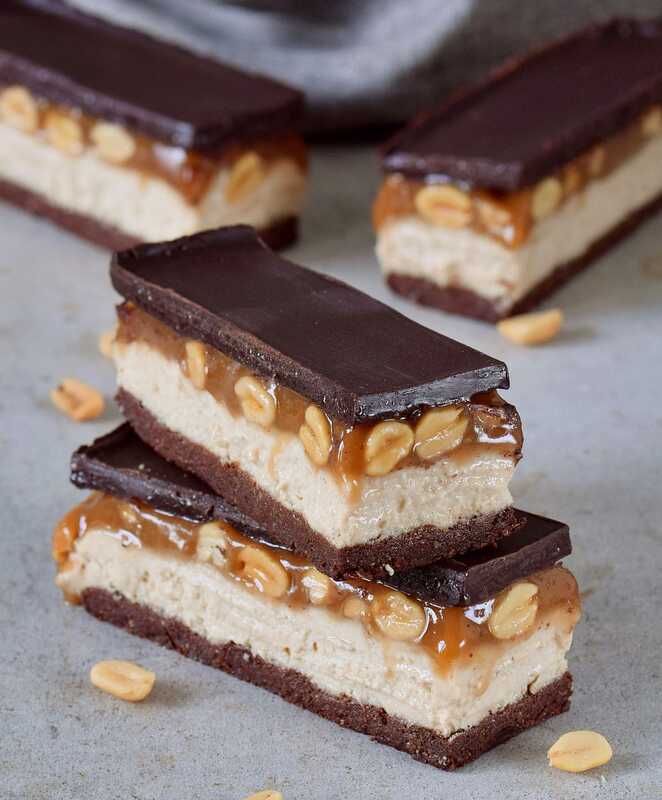 It’s also very delicious, however, it doesn’t look like a #foodporn caramel layer and in my opinion, these Vegan Snickers Bars deserve a caramel layer which looks just like that lol. The chocolate layer is easy to make but if you prefer an even easier version, then check the recipe notes below where I explain how you can make it with chocolate chips. You can store leftovers in the freezer, or in the fridge (they will be less firm though). 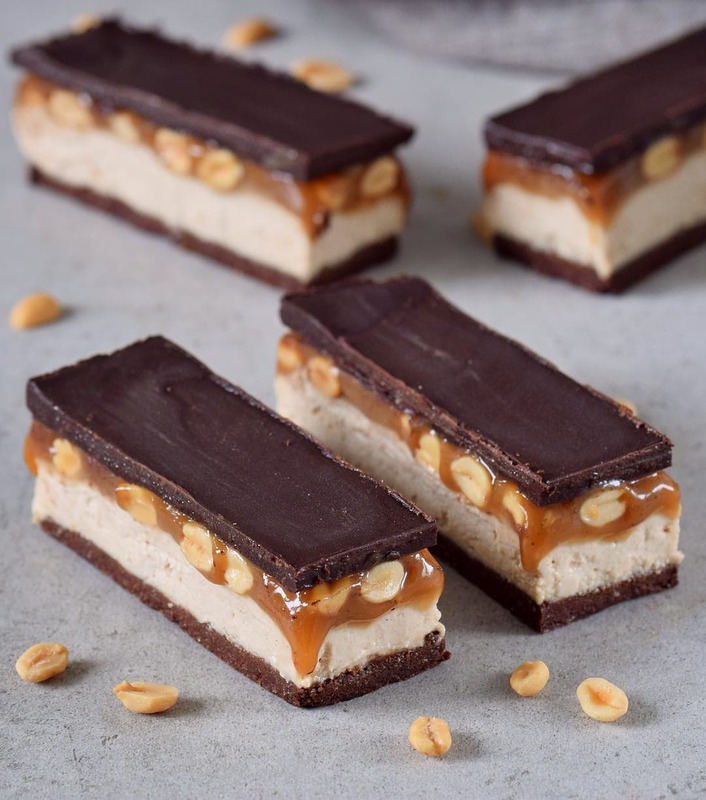 Please leave a comment below if you make these delicious no-bake Vegan Snickers Bars. You can also make a photo of it and post it on Instagram (or send me a DM). If you tag me in the caption + photo with @elavegan and use the hashtag #elavegan I will gladly check out your post and leave a comment. 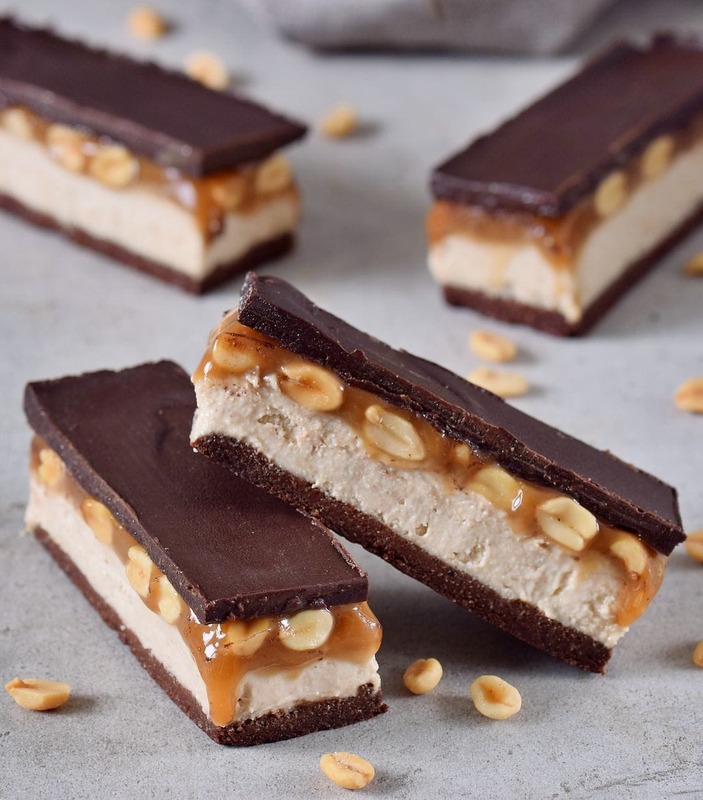 These no-bake Vegan Snickers Bars are the perfect treat because they contain a delicious caramel-, chocolate-, and cream layer. 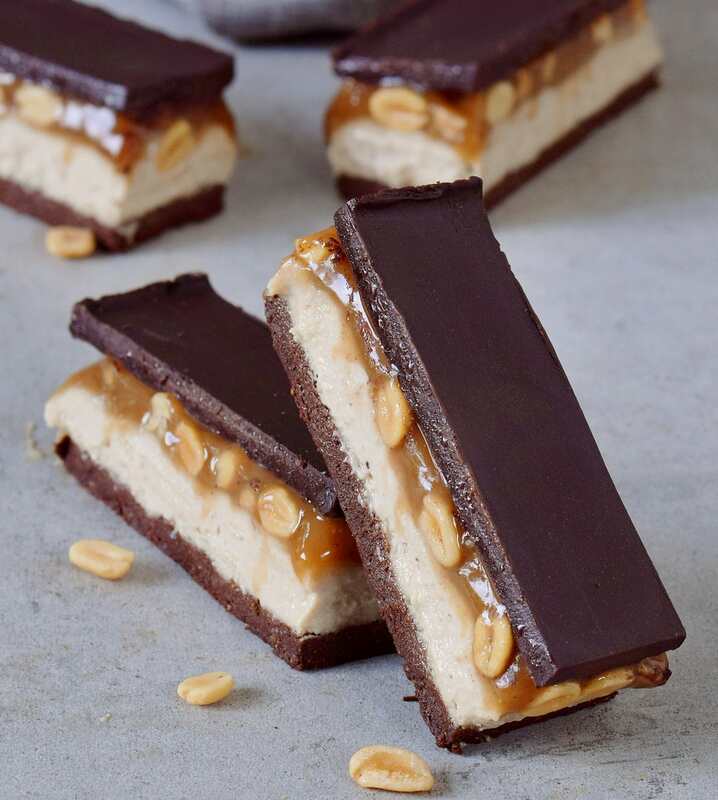 These bars are gluten-free, dairy-free, plant-based, and easy to make. Healthy caramel version included! Soak cashews in warm water for at least one hour, then discard the water (you can also boil them in water for 15-20 minutes or until they are soft). Make the no-bake brownie base as per the instructions in the recipe and press the dough firmly into a pan (lined with foil or parchment paper). My pan measures 8 1/2 x 6 inches. If you use a bigger pan the bars will be less thick. For the cream layer, process all ingredients in your high-speed blender or food processor until smooth and creamy. Pour the cream layer onto the brownie base and put the pan into your freezer until the layer is firm (approx. one hour). Put all ingredients for the caramel layer (except the peanuts) into a saucepan and bring to a boil. Stir with a whisk and let simmer on low heat for about 10-15 minutes until the mixture gets thicker. 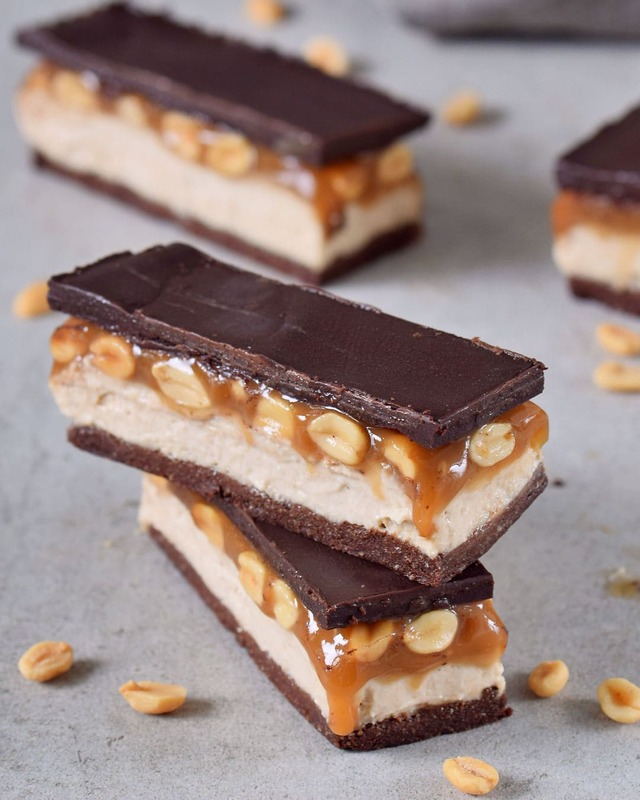 Pour the caramel layer onto the cream layer, place the peanuts on top, and put the pan back into the freezer for about 30 minutes. Check the recipe notes if you want to make the caramel layer with dates! For the chocolate layer, melt the cocoa butter and the coconut oil in a double boiler (I made a water bath). Place all ingredients in a saucepan and stir until combined. Pour the chocolate onto the caramel layer and put the pan back into the freezer for about 15 minutes. Check the recipe notes for a SIMPLE chocolate alternative. Cut into your desired size and shape (it works best with a hot knife). Enjoy your Vegan Snickers Bars thawed! Blend all ingredients in your food processor until super creamy and pour over the cream layer. As an alternative to the chocolate layer, you can simply melt 200 g of dairy-free chocolate chips (or 2 bars of dairy-free chocolate) in a double boiler and add 1 tbsp of coconut oil. Wow! 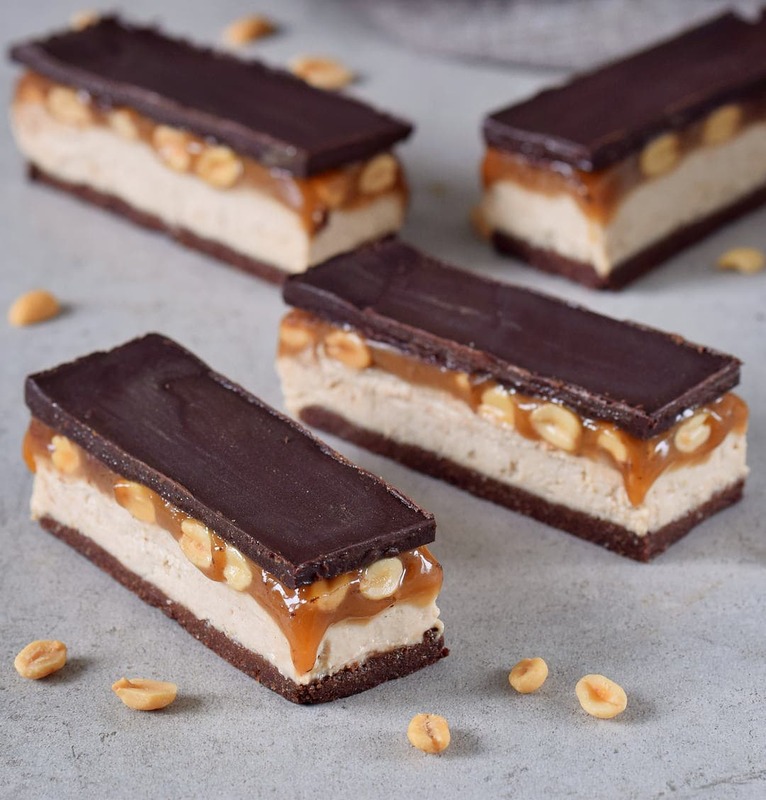 I loved reading the story behind the creation of these absolutely delicious-looking bars 😀 Snicker bars are one of my favourite desserts so I couldn’t be happier that you’ve created a healthy version! Thanks so much for taking the time to read my blog post! I am glad you like it and I hope you will give my recipe a try ???? These sound amazing! Easy to leave peanuts out and sub sunflower butter. Any ideas for nut free cashew sub? Hi any suggestions what alternative I could use instead of coconut milk? I am not a vegan myself, but I do enjoy light and good food. Those snickers were a success and my friends and family loved them! I used dark baking chocolate and they were really good! WELL DONE! Can you please share the calories? Super sweet but so delicious! A m a z i n g recipes! ♥️ Thank you! Can I replace the maple syrup or agave syrup with stevia? Do you mean pure Stevia? Or do you have a product which contains mainly Erythritol (but also a little bit of Stevia)? You definitely cannot replace maple syrup with pure Stevia powder (or drops). However, if you are using a product which mainly contains Erythritol then it might be possible to use that. Hello Ela!! Thanks for shearing your amazing recipe!! I’ll try them, it looks so delicious!! It won’t be like yours, of course! Thanks a lot!!! Cuddles from Argentina!!!???? Thank you, Romina! I hope you will like them. Just made these, they are in the freezer! Can’t wait to try them, the brownie base was amazing when I tasted it. I subbed macadamia nuts instead of cashews and the cream layer tasted great! Sounds yummy, but is it still considered a no bake recipee even though you bake the caramel or boil the cashews? Yes! It’s a no-bake recipe (you don’t bake it in the oven). It’s not a raw recipe.